Restored to a fully functioning state by the loyalty of his minions and the arcane science of an alien world, Soundwave takes a new name to reflect his new lease on life. No longer content to simply manage electronic warfare for the Decepticons, he charges into battle against the Autobots, using devastating sonic attacks to disable and disorient his enemies, so that his minions can finish them off. None of these things in his bio actually happen in the FoC continuity, but Hasbro apparently felt like they needed to release the FoC Soundwave toy three times in the first two waves of Generations Voyagers, so Soundblaster happened anyway. Soundblaster's history as a cheap reuse of Soundwave's mold stems back to the original Japanese release of the character in the 1980s, though, so there are certainly worse uses for the mold. Fall of Cybertron Soundwave (and Soundblaster, by inheritance) has a small army of data disc minions that he can deploy through a slot in his chest. Soundblaster comes packed with Buzzsaw, but he can store up to three minions inside him at a time and launch them all in one go. 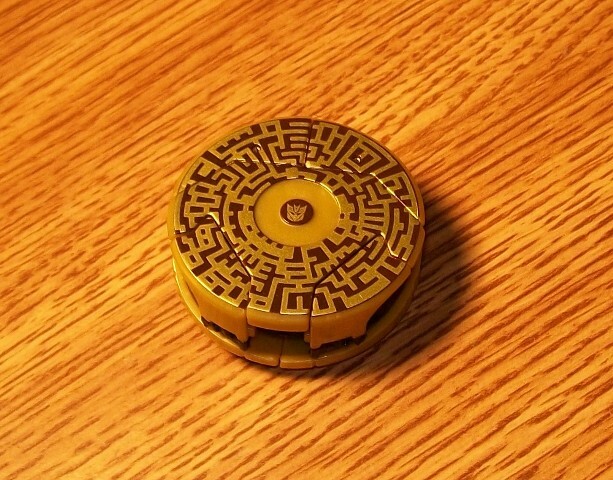 The minions auto-transform as they launch if they land on a hard surface, effectively taking the characters' 1980s gimmick and enhancing it with modern technology. The gimmick itself was never in doubt, but the WFC/FoC aesthetic isn't my favourite and I really, really didn't like the War for Cybertron Deluxe-class Soundwave, who was basically the same toy as Soundblaster here, sans gimmick. Because of that I was very wary of buying any of the three tape-player characters, though I had been vaguely considering having a go at Blaster if I ran into one. I stumbled onto Soundblaster when he was on sale for $10 less than the retail price, though, and decided to take a flyer on him instead so my Decepticon data discs would have somebody to hang out with. And considering my negative feelings for the original design...well, Soundblaster really had his work cut out for him. Alternate Mode: The biggest part of what's wrong with the current video game Cybertronian designs, in my opinion, is that don't even make a passing attempt to express the character of who they're meant to be. In my books that places them far, far below Dreamwave's earlier War Within designs or even the simple-yet-alien models used in the old cartoon. And Soundblaster is quite possibly the worst offender, especially in alt-mode. His vehicle mode is an...armoured box? With fangs? And some sort of little chair on top of it? None of that really says "Soundwave" to me. He's cast mostly in slate grey, with some light grey, silver, yellow and gold highlights. The colours are nice, but they're distributed across the vehicle haphazardly, not creating any distinct features or calling the eye to any one part of the design. That leaves Soundblaster almost looking like some sort of alien armoured breaching vehicle -- "almost". The transparent red wheels sort of ruin the effect, I'm sad to say. 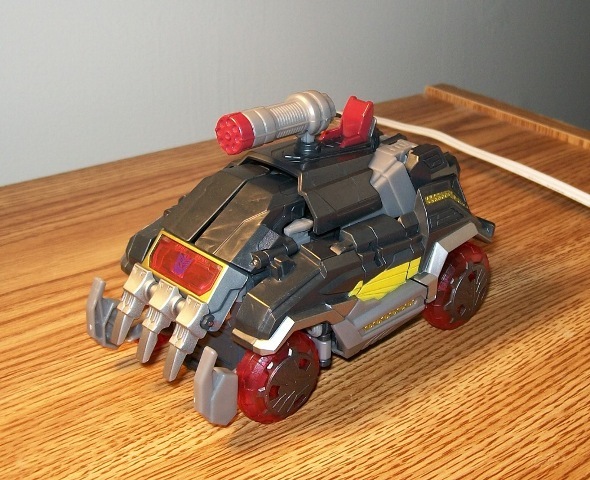 Soundblaster rolls around on said wheels, and his weapon can mount in a hole atop the vehicle. It's positioned to look like whoever sits in that tiny seat can serve as a gunner, but the likes of Rumble and Frenzy are way too big to sit there so the whole thing winds up being a bit of a non-sequitur. And while he can, in theory, eject his minions in this mode, you need to partially untransform him to do it and they don't fall far enough to auto-transform. Honestly, Soundblaster's vehicle mode feels vestigial. It's clearly just there because the designers at High Moon felt obliged to give him one since their game had "Transformers" on the label, and they put about as much thought into it as that would suggest. Robot Mode: Soundblaster's robot mode is better, both in comparison to the weak vehicle and the even weaker War for Cybertron figure. Again he's mostly grey, but with slate grey and light grey mixed about evenly. Silver and gold highlights are still plentiful, though the yellow is deemphasized a bit. His transparent red wheels are still visible and a touch unsightly, as is the red "tape door" on his chest. And that tape door is one of the very few "Soundwavey" things about the design. Other than his head and shoulder cannon, nothing else about the design even vaguely resembles who it's meant to be. Where the original was a blocky, squared-off affair, FoC Soundblaster is all sharp angles and moviespikes. He also has the obligatory V-shaped torso that all Cybertronian Decepticons were apparently fitted with alongside their faction symbols, in stark contrast to his stocky predecessor. None of these faults are Hasbro's, but rather belong to High Moon, who apparently thought it a great idea to design a Soundwave that looks nothing like Soundwave. In this case, though, Soundblaster's colours help a lot. With different colours on a different-looking body, it's easy to look at this as a new character entirely instead of a really poor rendition of a classic favourite. 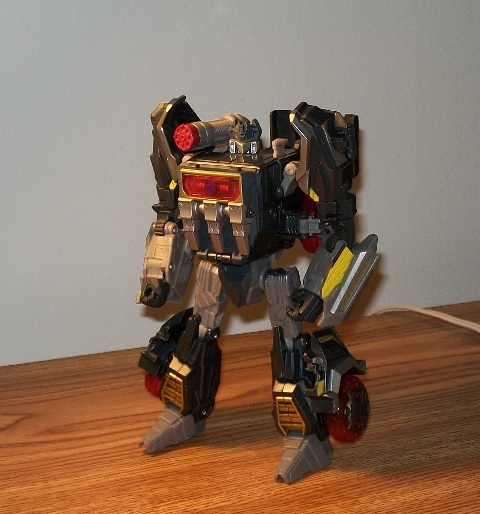 Because of that I can enjoy Soundblaster without the disdain that I direct to his more traditionally coloured mold-mate. Even though he lacks ball joints entirely, Soundblaster makes good use of universal joints and swivels to get a great range of motion out of his limbs. His transformation design means that he lacks a torso swivel, but he's got the right joints everywhere else on his body so he's great fun to either play with or pose. Of particular note: the designers took care to ensure that he's got enough range of motion in his arms that he can reach up to press the "eject" button on his left shoulder, a nice touch to be sure. And the figure is very light for a Voyager (what with his entire torso being hollow) making him very easy to pick up and handle. 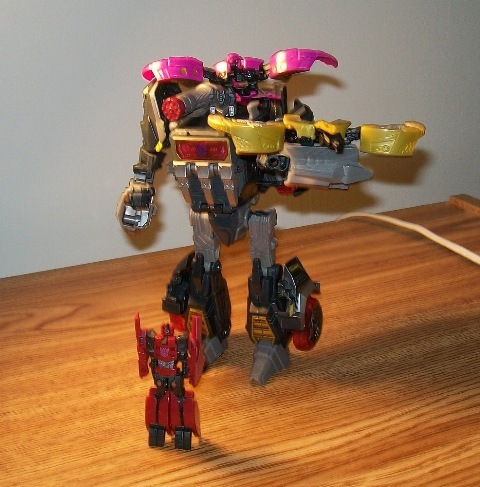 In terms of accessories, Soundblaster has two: his traditional shoulder cannon, and Buzzsaw. Hasbro saw fit to omit the character's signature concussion blaster, and also dropped the in-game weapon (modelled after Optimus Prime's original laser rifle, oddly enough) that he's pictured with in his packaging art as well. That seems like a bit of a rip-off, since the original Deluxe-class version of this design came with both. But those aren't the accessories that anyone cares about. The data discs are the main event here, so how do they work? Unfortunately, the answer to that is just okay. The ejection mechanism is quite primative -- though the tape door is spring-loaded and pops open with the push of a button, the discs themselves need to be ejected by manually pushing in a plunger on Soundblaster's back. That's a surprisingly low-tech solution, but it does the trick...as long as the discs in question fit properly into Soundwave. Some of them, unfortunately, do not. The figures need to fit perfectly for the gimmick to work, and if you get a data disc that's a fraction of a millimetre too big or too small, he'll either try to stick inside Soundblaster's chest or fall out too easily. Either way, it hampers the ejection and means that the disc might not land flush enough to trigger the auto-transform. But flaws aside, it really is a nice trick. The three-disc capacity was a huge surprise when I opened him up, and it allows for some dynamic play scenarios for the younger crowd (or any adults who are still into that). 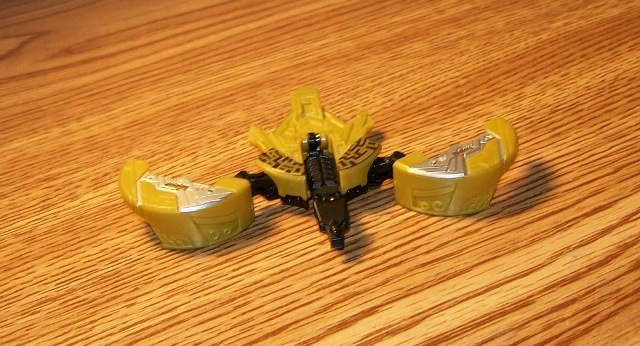 Frenzy, Buzzsaw, Ratbat: eject. Operation: annoy my wife. Er, sorry about that. Where was I? Oh, yes. Soundblaster comes together very nicely in robot mode, but he falls very squarely on the "toy" side of the ledger and isn't a particularly stylish display piece. For those of us who want that, though, there's Masterpiece Soundwave to be had. On the other hand, those of us who want to send a legion of minions flying out of his chest, automatically transforming and springing out at irritated spouses, the Fall of Cybertron toy isn't bad at all. Buzzsaw: The "bird" cassette mode is easily my favourite of the four basic data designs (humanoid, bird, cat and rhino), but in all honesty Buzzsaw is kind of plain. 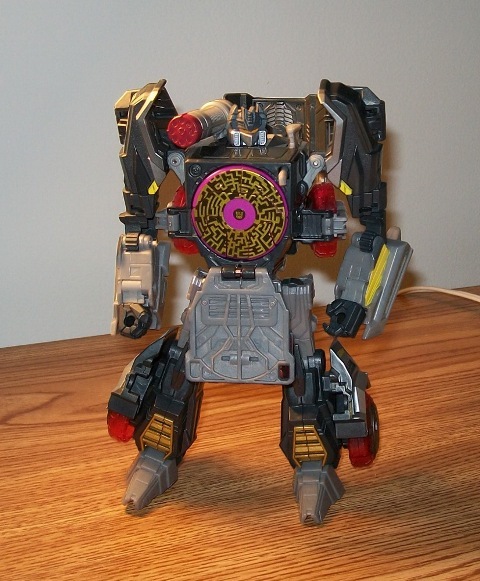 I'm a big fan of Buzzsaw the character, but in toy form he's always been Laserbeak's blander cousin. This iteration of the character also shares his mold with Sundor and (with significant remolding) Ratbat, and they outshine him as well. His gold, silver and black scheme is classy, but compared to bright red, deep pink or eye-searing orange he's just a tad boring. As a toy, though, he's just as good as the others. The bird mold transforms smoothly when fired out of Soundblaster's chest, or even when pushed down while the disc is sitting on the tabletop. He transforms completely without any parts needing adjustment after the fact, and has a lot of joints to fiddle around with (although they all pop back to their default position due to the spring-loaded transformation). He can also perch nicely on Soundblaster's forearm, as is traditional for the bird-cassettes, and cuts a nice silouhette while doing so.